A friend of mine posted this a few days ago on Facebook. But like all memes it suffers from simplicity. Often memes are just plain wrong upon further reflection. Sometimes they are right “most” of the time. Maybe they are mostly wrong except in a few circumstances. This one I think is mostly right, but with a few caveats. 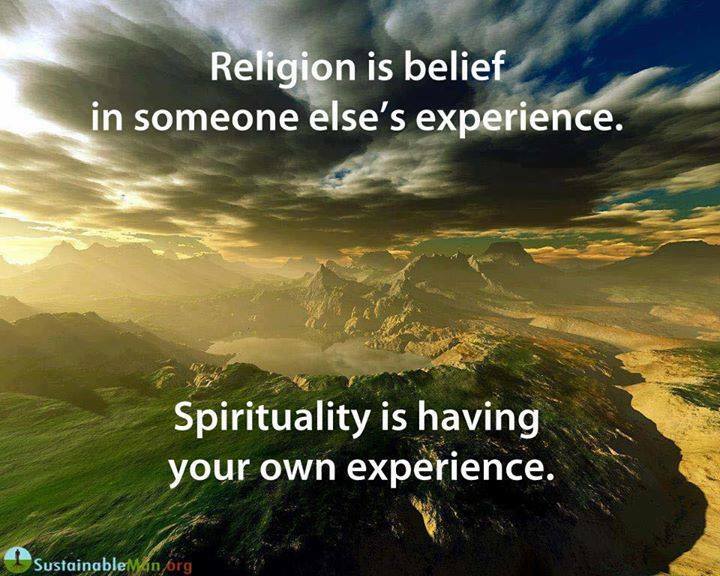 First of all, most religions are not “someone else’s experience.” They are a lot of someone elses. Where Christianity is concerned that numbers in the dozens. And that only relates to its scriptural base, the bible. If you add all the other writings not canonized, but still reflective of how people of generally the same time frame came to see the Jesus experience, then it grows substantially. And of course, that says nothing to all the theologians and biblical scholars that have expanded our knowledge of exactly what that experience was, and how it should be conceived of. They number in the thousands over the years. And of course the mystical writers have their own experiences to relate. So we actually have a lot to dig through in discerning what that “experience” is. Much the same could be said I suspect of most other religions. The end belief system is the product of hundreds if not thousands of minds. And of course, there is much conflict between minds. 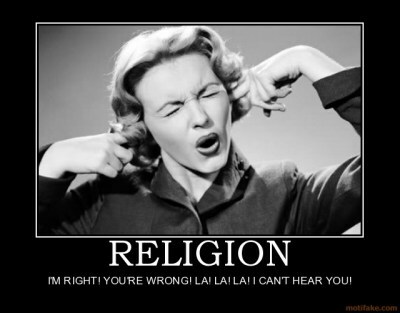 But religions have surely set dogma and told believers that they should adhere to those beliefs. They divide them often into those that “must” be adhered to, those that should be, and perhaps those that are “up to your conscious”. And these change too, moving from one category to another. That is where the trouble begins. Do we dare question the insights of a St. John of the Cross? Or The little Flower Theresa? Are their visions and spiritual deductions sacrosanct because of their sainthood? Is mine less so because I lack the imprimatur of the Church? That is where one’s spirituality conflicts it seems to me. And it is where the Church, standing for religion errs. 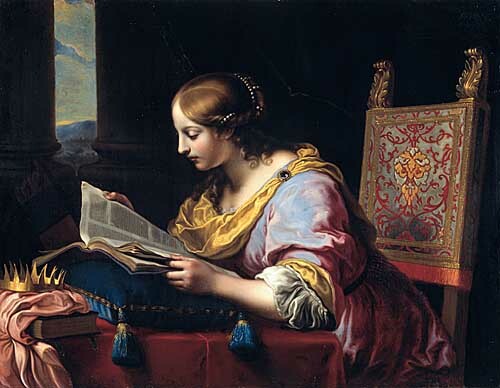 For the Church seeks, based upon its self-defined expertise, to tell the parishioner what she must believe to remain within the good graces of said institution. An institution made by humans I might add, whatever your current theology might be about what Jesus intended when he laid the mantle upon Peter’s shoulders. This is error as I see it. The Church has a serious and important role. That role is to nurture, care for, and raise up the individual who comes seeking. It can and should not judge, but only facilitate with love and forgiveness, warmth and understanding, that relationship between God and creature. It should in no way be a barrier, EVER. When it does so, well as Jesus said, better tie a millstone around its neck and drown it. And of course many would do just that. In the name of God. And they are just as wrong as those who see the Church as God, speaking for, judging for, and forgiving for God. For that purpose of feeding the hungry, clothing the naked, tending to the sick, and ministering to all who are suffering, is the primary goal and purpose of religion, or Church. And if, I would argue, it limited itself to that purpose, it might well effectively reduce suffering in the world in a degree that would stupefy modern governments. That is not it’s only purpose however. It serves to be the gathering forum for believers, and that is of no small importance. For the scriptures make clear to us, throughout them, that the gathering of the people in “church” is valuable and necessary. In some sense the Trinity teaches us that–one God in three forms operating in perfect community. We are communal creatures, and Church can and should mirror that perfect community. We are called to act selflessly, and no better place to learn it SHOULD be the Church. Instead of course, we find nothing but judgment and rejection for so many. As if God needs humans to prevent other humans from approaching the altar. As if somehow the Church sanctifies and not God. Spirituality is not a substitute for church in this sense. All too many people are walking around proclaiming their spirituality and their self-interpretation of scripture. The trouble is, scripture is not something that one can “just understand with an IQ of 100” as a self-proclaimed atheist recently told me. Although not a believer, he insisted that our “debate” be limited to the four corners of the bible, and using the common sense meaning of the words themselves. Of course such a notion is absurd. This is what comes from unfettered “spirituality” absent the restraints religion heterodoxy. But heterodoxy is in the end a human endeavor, and should never be confused with God, now with eternal truth. It is the best of what we understand now, and not what we may realize tomorrow. Smart churches do this. All churches should do this. Churches should be spending more time helping its members explore and think. As in all things, critical thinking skills apply. 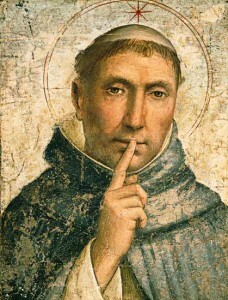 The dogma of the present church should but serve to start the discussion, and the exploration. God gave us these marvelous thinking instruments and they are meant to be used. Only by the deepest and broadest searching will we be rewarded with the most meaningful experience of God. So, it’s not all one, or all the other. Each goes wrong by itself. It is the blending of both, and the value of both that enriches the individual.